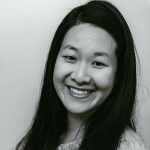 Published Aug 16, 2018 By Julia 2 CommentsThis post may contain affiliate links. 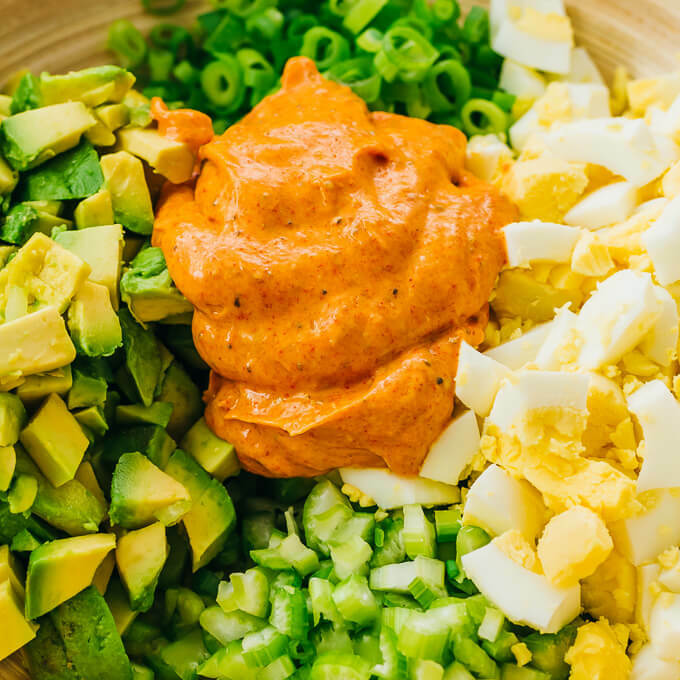 An avocado egg salad with a spicy mayo dressing — tastes like a deviled egg salad! 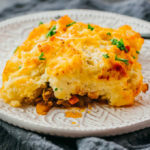 It’s an easy and healthy recipe, great for anyone on a vegetarian, low carb, keto, paleo, or whole 30 diet. 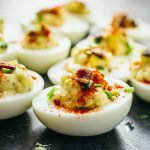 Spicy deviled eggs are one of my favorite egg-centric foods, and this avocado egg salad is really just an excuse for me to enjoy them in another form. That’s why I like to call this a deviled egg salad, and it’s my favorite twist on the classic and traditional egg salad. 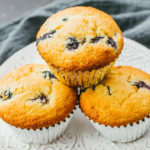 It’s really easy to make this recipe, and hard to mess it up. 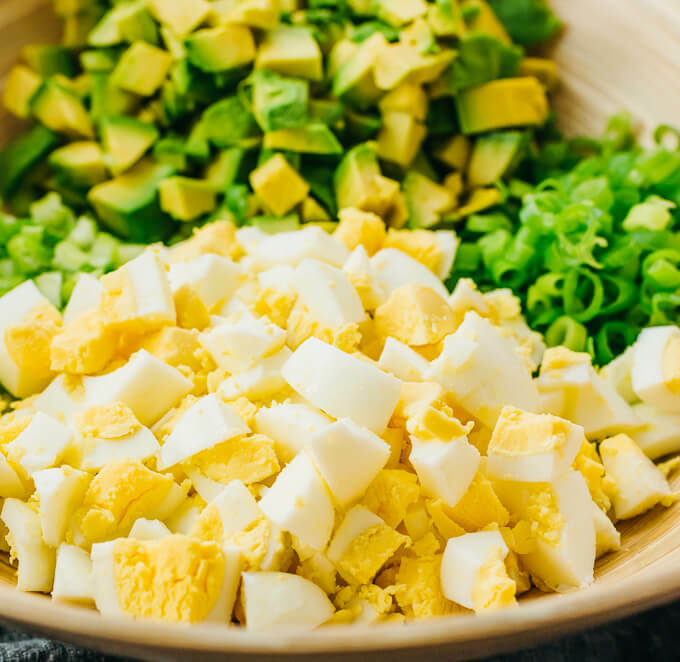 Hard boiled eggs, celery, avocado, and scallions are chopped up and added to a bowl. Stir up a handful of ingredients to make the spicy mayo dressing, toss with the salad, and voilà! You’re done. What I love about this salad is how smooth and creamy it is, thanks to the chopped avocados and eggs. And in case you get bored of the creaminess, the diced celery is there to assuage your boredom with its crunchiness. If you’re looking for a simple vegetarian salad with a bit of a kick to enjoy on hot days, this one’s for you! Wondering how to make the perfect hard boiled eggs? If you’re like most people, you simply boil eggs using a pot on the stovetop and pray that the shells end up easy to peel. This is usually hit or miss. If you have a pressure cooker like the Instant Pot, I highly recommend using it to hard boil eggs by following this recipe. It’s often called the 5-5-5 method, since it takes about 5 minutes to pressurize, 5 minutes to cook, and 5 minutes to release pressure. Pressure cooked eggs are ridiculously easy to peel, the kind of eggs where the shell effortlessly falls off in large pieces. It’s a foolproof method, and much easier than doing it on the stovetop. There are so many delicious things you can put in an egg salad. In this recipe, I include chopped avocado, diced celery, and sliced scallions. But that’s just the basics. 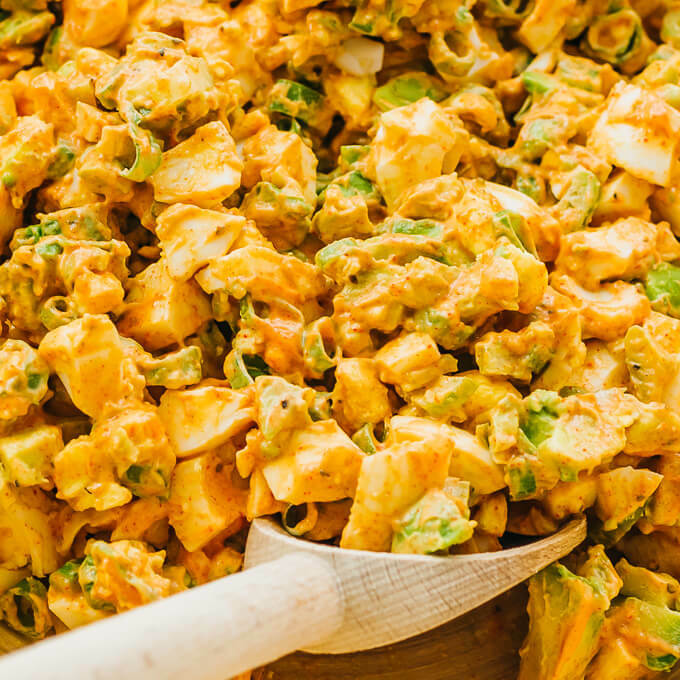 You should use fairly ripe avocados for this egg salad. Ripe avocados are softer and add to the overall creaminess. I use Haas avocados, and either buy them when they’re ripe or wait for them to ripen on the countertop. 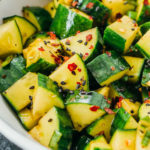 If you don’t have time to wait for the avocados to ripen, I suggest cutting them in smaller pieces than you ordinarily would — more like a dice or fine chop than a rough chop — that’ll help mask the fact that the avocados aren’t ripe enough. 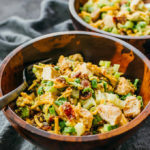 This dressing is inspired by my Instant Pot shredded chicken burrito bowl with spicy dressing, which was so good that I knew I had to find another excuse to use that dressing again. Note that it’s on the spicy side. I call it a “mildly spicy” dressing, whereas Mr. Savory Tooth considers it “barely spicy.” If you tend to be someone who can’t handle spicy foods, especially those involving cayenne, I suggest halving the amount listed in the recipe. I usually enjoy this egg salad by itself. Each serving is on the larger side, and it’s filling enough to be a meal. But that’s not the only way you can enjoy this. 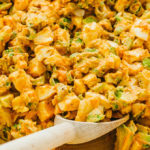 For example, you might want to use this egg salad as filling for a breakfast sandwich or wrap. My local grocery store sells low carb tortilla wraps that are only 6g net carbs apiece. 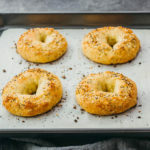 Or you can serve egg salad on almond flour crackers, low carb biscuits, or keto bagels, all of which sound delicious. Enjoy! 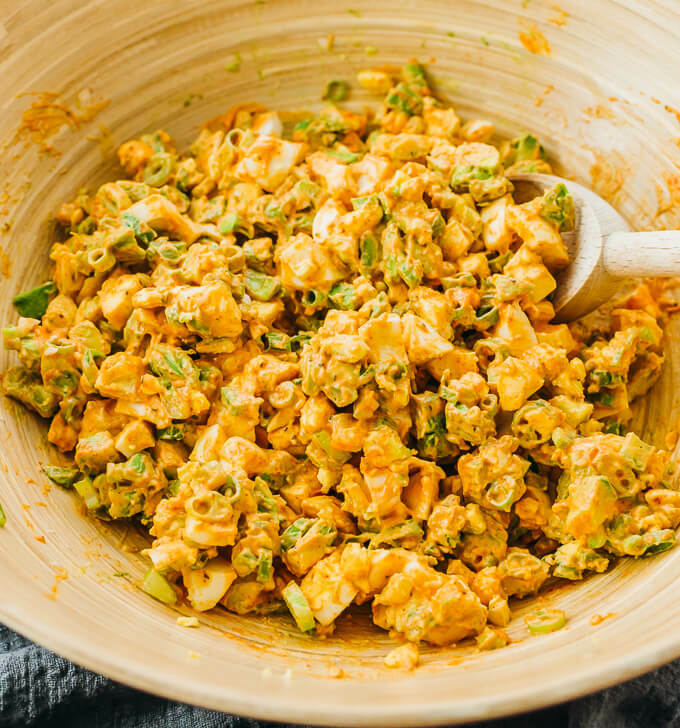 An avocado egg salad with a spicy mayo dressing -- tastes like a deviled egg salad! 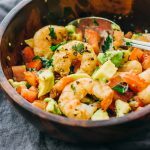 It's an easy and healthy recipe, great for anyone on a low carb, keto, paleo, or whole 30 diet. Place the eggs in a saucepan. 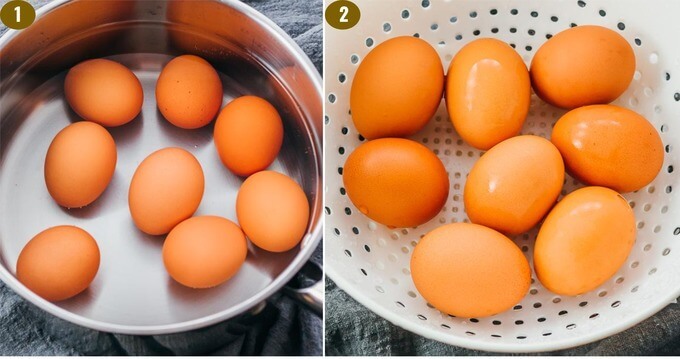 Fill with cold water to cover the top of the eggs. Bring to a boil over high heat and let it boil for 1 minute. Remove the pot from the burner, cover with a lid, and let sit for 10 minutes. Or use an Instant Pot to make hard boiled eggs. While waiting for the eggs, prepare the dressing. In a small mixing bowl, combine all dressing ingredients and stir until very smooth. Store in the refrigerator until ready to use. When the eggs are done, strain and run under cold water for a few minutes. When cool enough to handle, peel and chop the eggs. 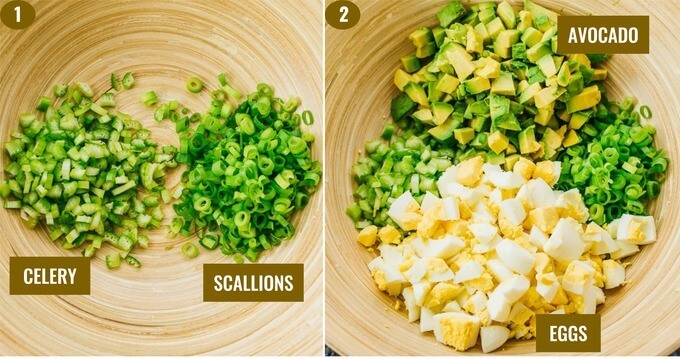 In a bowl, add chopped eggs, avocado, celery, and scallions. Add dressing and stir it in. Add salt and pepper to taste. Refrigerate until chilled, and serve cold. This recipe yields 3.5 g net carbs per serving (1 large egg salad or 1/4 of recipe). The Instant Pot 5-5-5 method for hard cooked eggs generally means 5 minutes at high pressure, 5 minutes natural release, and 5 minutes in an ice bath (though it doesn’t take 5minutesin the ice bath to make them Ready to peel). And this *is* the best way to make hard cooked eggs!